Andrew Dickson was a star player all the way through Vikings juniors in the late 1990s and emerged to the senior club in 2001. 16 years later he reaches his 200 senior game milestone! His senior debut aged 18 was memorable, straight to 1st Grade as a replacement in Round 1 2001 V Wests at Canberra Stadium in a Brumbies Super Rugby curtain raiser. He announced that night that he was a special talent. ‘Chewy’ never really got to enjoy much Colts rugby as he settled into 1st Grade excelling at centre, fullback and wing and racking up points at a rate never seen before or since. Through the mid 2000’s Chewy spent several seasons as a regular in Brumbies B/Runner teams and playing Sydney 1st Grade for the Canberra Vikings where he continued to excel amongst top company. Chewy has probably been best known for 5 or so key traits; 1. His lethal left foot step that still bamboozles opponents 2. His ultra-competitive nature and desire to win – (even at tiddlywinks) 3. His once in a lifetime scoring ability from both tries and goals (Club Record holder, 2,000+) 4. His loyalty, passion and love for the club – happily playing almost all backline positions across all grades and backing up whenever required 5. His laid back fun loving attitude. Current President Brendan ‘Trendy’ Allardyce has been privileged to watch the Dickson journey; “He is another of my all-time favourites and for almost 20 years I have been watching him razzle and dazzle opponents at all levels. He is just so competitive and so skilful and he loves the club. I don’t think his point scoring records will ever be broken. 200 Games and over 2000 points makes him a genuine club legend” Allardyce said. 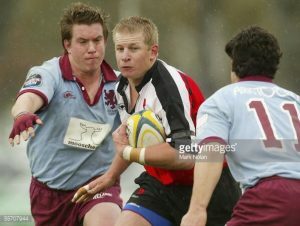 Along with Chewy Dickson playing his 200th game in 4th Grade V Royals, this week’s old boys Hagar’s event salutes other milestones including Jake Knight’s recent 100 1st Grade games along with 100 club games this week for Club Captain Josh Hitchins and try scoring machine JP Mynhardt. We encourage all old boys, sponsors, supporters and family to come down to VP this Saturday to cheer and raise a glass for this amazing quartet of Vikings players in Andrew, Jake, Josh and JP.